The day I know we’ve slid into an actual authoritarian police state will be the day when I do not see numerous books on the shelf in a public library accusing the current President of destroying the country, being an idiot, or just being evil in general. We won’t have a news networks that are pathologically dedicated to mocking everything the government does. Those things don’t exist in a police state. You don’t get to be a talking head on a popular news network, you get to be shot in the head. I’m trying very hard to remember the certainty I felt when I wrote those words. Because I don’t feel it now. I’m not going to bother linking to any news stories. There are too many to choose from. The Daily Show segment was probably the most amusing, though. I take back what I wrote. I thought about deleting the original post, because I know longer believe it to be true, but I think it’s important to oppose censorship, even and especially self-censorship. Let the old post stand as a reminder that I was wrong. Pope Francis is Time’s Person of the Year, but in this blogger’s humble opinion, Edward Snowden should have been. Surveillance is the censorship that tricks you into censoring yourself. Yeah, I think that big data vs privacy will be the defining issue, at least for the first part of the decade. The liberal vs conservative value struggle will always be in the background, with a possible note on how dysfunctional the ideological difference currently is. “The liberal vs conservative value struggle will always be in the background…” You mean it’s regularly like this in the U.S.? Last decade is the only one I have personal experience of, and it seems borderline toxic. Perhaps I’m overly sensitive, having grown up in one of the Nordic countries where cooperation and getting along have traditionally had more of a place even in politics. It’s hard to say for certain. A lot of people will say that the ideological divide is getting more strident and toxic, while others will say that today’s Tea Party and “Stop Obamacare at any cost” policies are just yesterday’s Swift Boaters, so this is all just business as usual. I’m agnostic on whether things are getting worse or whether they were always this bad. Having not paid attention to the politics of the 80s and 90s myself (being that I was a kid at that point), I have no personal experience since I wasn’t paying attention. There was one infographic I saw that might support the “things are getting worse” argument. 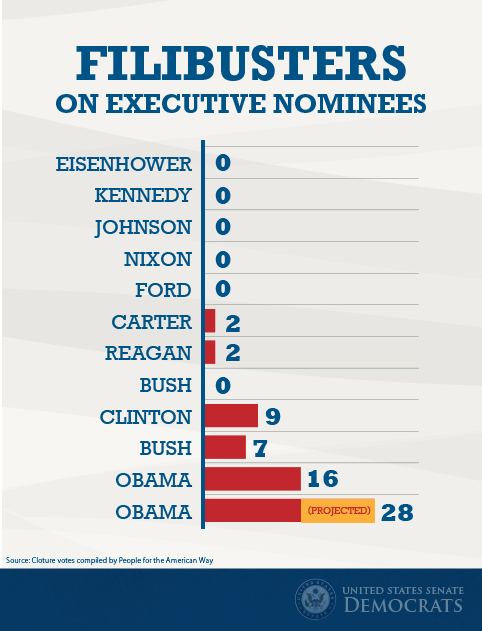 It shows the number of executive nominees that have been filibustered by Congress from Eisenhower to Obama. It does support the sense that the dysfunction is even worse now, if there are this many filibusters that keep anything from happening. I imagine that, compared to the politics of Nordic countries, however, it’s incredible that US politics hasn’t already devoured itself like a pack of starving hyenas. It seems to be how we like to do things on this side of the world (aside from Canada; my understanding is Canadian politics are much more polite). Thanks for the link. It does appear to me that U.S. politics is an exhausting way to do business, however else you might want to describe it.